Many little girls dream of being the prima ballerina, twirling in the spotlight across the stage. Whether your ballerina is small and new to ballet or has been dancing her heart out and practicing for years, you can scrap her story with Tiny Dancer. Grab the separate parts to this kit for only $1.00 each during our Bits-N-Pieces release this week. Preview linked to the sale. FAIREST OF THEM ALL by Magical Scraps Galore is a magical collection inspired by one of the all-time favorite Princesses, Snow White. 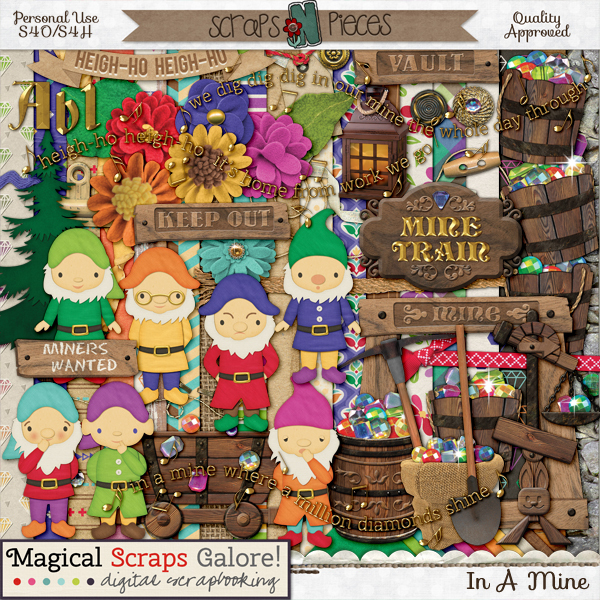 In beautiful rich colors, this gorgeous kit is filled with wonderful patterns and elements such as the fairest Princess and her woodland friends, a magic mirror and poisoned apple, gorgeous flowers and a wishing well, among many other fabulous goodies. This is the perfect collection for scrapping your magical meet and greets, your princess meals, a Bibbidi Bobbidi appointment, a princess birthday party, and so much more! Find the full collection at 58% off -or the individual kit and add-ons at 30% off through Tuesday midnight at GingerScraps, Scraps N Pieces and The Digichick.